Subscribe to get full access to this operation and the extensive Spine Surgery Atlas. Learn the C6 corpectomy(for cervical myelopathy) with Medtronic AsterX expandable titanium corpectomy cage and ZEVO anterior cervical plate surgical technique with step by step instructions on OrthOracle. Our e-learning platform contains high resolution images and a certified CME of the C6 corpectomy(for cervical myelopathy) with Medtronic AsterX expandable titanium corpectomy cage and ZEVO anterior cervical plate surgical procedure. Cervical spondylosis is a common age related degenerative process which may lead to development of axial neck pain, cervical radicular symptoms or cervical myelopathy. Most common levels are C5/6 followed by C6/7; they are associated with the most flexion and extension in the subaxial spine. Various pathologic processes in the cervical spine may cause mechanical compression of the spinal cord and yield to degenerative cervical myelopathy. It is a slowly progressive disorder usually caused by spinal cord compression and ischaemia due to age related changes in the spine. Cervical spinal cord compression generally arises from protruded degenerate cervical discs, anterior or posterior cervical canal calcification processes, facet joint hypertrophy or ligamentum flavum hypertrophy. The pathophysiology is complex and often involves both static and dynamic processes that usually result in progressive neurological dysfunction. Although asymptomatic degeneration of the cervical spine is common within the aging population, when these changes lead to myelopathy, patients are at risk of motor, sensory and autonomic dysfunction, as well as a reduction in quality of life. Cervical myelopathy is generally considered a surgical disorder due to its natural history. Surgery may arrest progression and can improve neurological outcomes. The decision to use either an anterior, posterior or combined anterior-posterior surgical approach depends on many factors. Several variables are to be considered including; ventral versus dorsal compression, sagittal alignment, focal versus diffuse disease, the presence or absence of radiculopathy or axial pain, age, comorbidities, and surgeon familiarity with each specific procedure. The complex variables that one must consider reflect the heterogeneity of clinical presentation, variable severity, and speed of progression inherent in degenerative cervical myelopathy. Central corpectomy is an anterior decompressive procedure which is ideally suited for multilevel cervical spondylotic myelopathy, large calcified cervical disc or osteophytes compressing the ventral spinal cord, as it directly addresses this ventral compression. 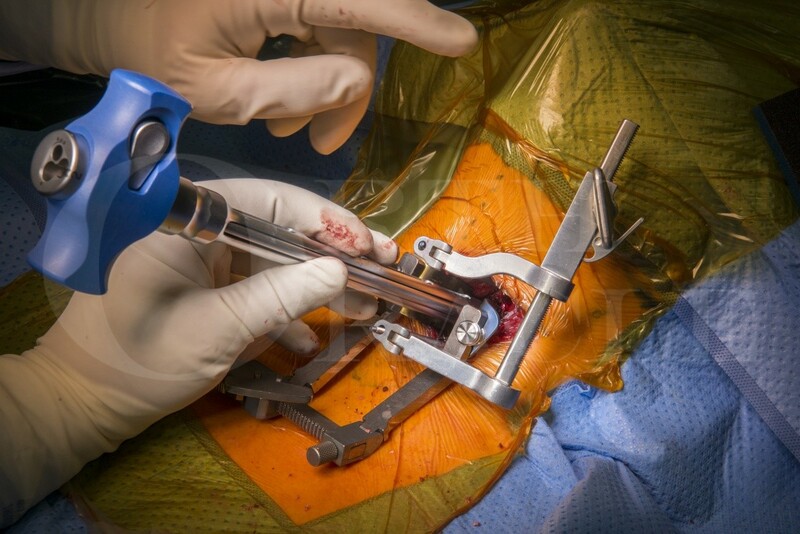 The usage of cervical cages for reconstruction after discectomy and corpectomy are common place and avoid disadvantages of tri-cortical autograft harvesting such as donor site pain, fracture, and poor bone quality interposition grafts. In-situ expandable cages improve the adjustment of the cage to the corpectomy defect, restoring physiological height and optimise the pressure exerted on the endplates (avoiding over distraction and later cage subsidence) whilst distracting enough to preventing kyphotic deformity of involved segment and cage migration. This technique details the operative approach is as described by Southwick and Robinson and the use of the Medtronic AsterX expandable corpectomy and ZEVO anterior cervical plate system. Institution : The Avon Orthopaedic Centre, Bristol ,UK. Author: Author: Neil Upadhyay FRCS. Institution: Institution : The Avon Orthopaedic Centre, Bristol ,UK.